We couldn't wait to knew what will going to happen to Ra On as Crown prince caught her in the palace while she was was trying to run away. Crown Prince gave her a doze as she told she is out for an errand. He was surprised to knew who in the palace had sent a newly eunch to run an errand this late at night. It was a very funny scene. Ra On was too good she didn't gave any expression that she is guilty and had been caught. Crown Prince handed Ra On over Eunch Sung and scold him for not training the new ones also for light security. She didn't want to go back and request the crown prince to beat her. As for crown prince he was enjoying her situation and wanted to take his revenge slowly. He calmly replied its not nice to hit a puppy so you must go on. Now things for Ra On will going to be hard as she been notice by the crown prince. The time for eunch test arrived. The royal Physician for the first round was there. It was Ra On turn we were worried as well curious how she manage to stay in the palace. Will someone going to help her or a miracle would occur. The miracle happen. The royal physician was called in by the queen he ran out in hurry and the stamp fall on Ra On's exam paper. It was neither pass nor fail but in between. She was selected and pass the first round. The second round she thought she will make it a fail and will easily be kicked out of the palace. The crown prince notice and didn't let her mark wrongly. At first we thought he would make her fail but wasn't his intentions, he helped Ra On not knowingly mark the false but to pick up the right answers. She passed the second round. Things were getting too interesting as the story proceed. Yoon Sung was at the ginseng house. We come to knew he is interested in paintings. This remind us of specially two dramas the first we watch "Painter of the wind" the second was "the maids". There were many other but these two were too good to remember. Yoon Sung was drawing the picture of naked Ginseng but the ginseng fall for him and wanted to do anything . She also tried to give her body but Yoon Sung refused my heart doesn't flutter at this. Waoo he is the man of his will power. Ra On was feeling uneasy staying with other eunch so she found another room which was set to be empty for a long time and nobody use it. She came there and was scared seeing something in black flew away. We also got scared that it might be some supernatural element but it turns out to be Kim Byung Yeon the bodyguard & friend of the crown prince as well as the the 3rd male lead. Ra On was back to her senses. The crown Prince came they had a drink together. It was really a funny scene for Ra On she didn't knew it was the crown prince and treat him like an ordinary fellow. She drank until she passed out. It wasn't end she she came back to her senses Crown prince was a little annoyed and called her a disobedient puppy and ask Byung Yeon how to train disobedient puppy. 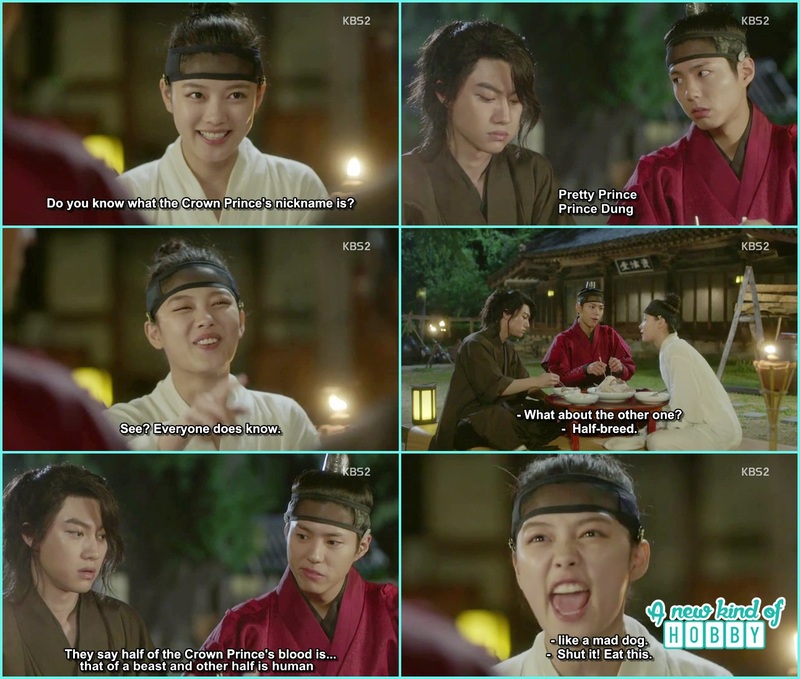 The next moment neither of the crown prince nor us expected Ra On would bite Crown Prince finger with her sharp teeth. The next day Crown Prince was thinking expressionless watching his finger how a puppy can bite mei was bit by a dog and then laugh by himself. We surely knew he was on something with Ra On and won't leave her alone. The King ordered the feast at Prime minister house. It was in honor to celebrate Queen's pregnancy. Eung Sung with other was sent there to take care of things. He also didn't like Ra On and wanted to teach her a lesson so he sent her to catch 20 chickens and thought she can't able to do that. It was very difficult for Ra On but she had to catch the chicken as ordered she manage somehow and end up falling from the roof. Yoon Sung happen to catch her as he was standing there. He found out about Ra On disguised as a boy eunch she actually is a female. But didn't reveal for some reasons. This reminds us of Sunkungwan scandal where one of the lead found out a female disguise as a boy but couldn't tell anybody and end up getting hiccups when ever he saw her. As Crown prince is known for being the troublemaker. He some how come to knew about the feast and went there to celebrate. Prime minster and other didn't like him coming but he said there isn't any feast without me lets celebrate and enjoy. There we come to knew Yoon Sung is Crown Prince childhood prince and son of prime minister. But due to some misunderstanding Crown prince and Yoon Sung is now a bit far. The chicken Ra On caught was actually didn't needed for the feast so she boiled it for themselves and invited Crown Prince along with Byung Yeon. She shared the chicken with them. It was another funny scene Ra On make fun of Crown Prince and try to make him laugh. 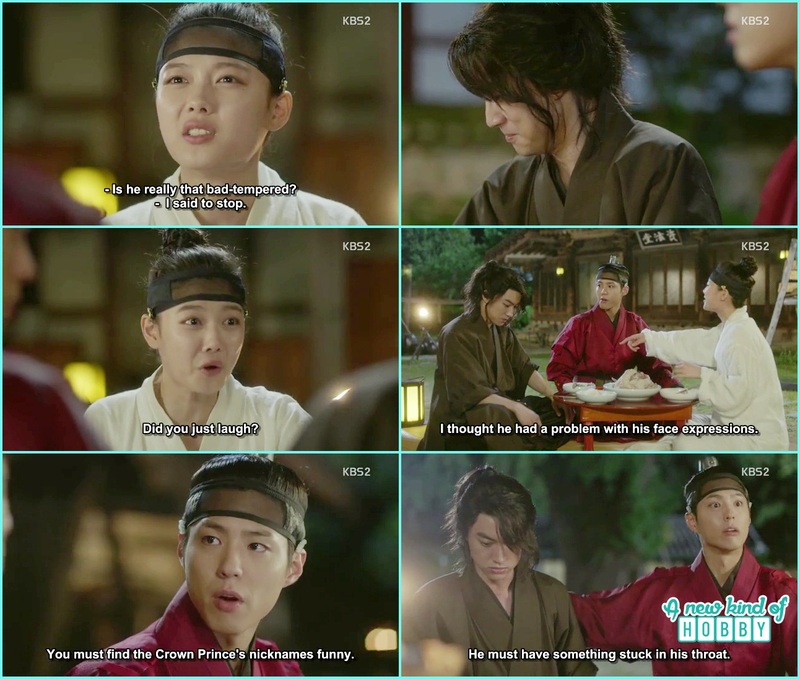 She told she saw crown prince at the feast but it was just the back of the neck and then she laugh. She also told the crown prince has a nick name ... Crown Prince suddenly replied "Pretty Prince" and same the same time Byung Yeon replied "Prince Dung" and they laughed as well we. It was because Crown prince has a very nasty nature and create problems for nothing. Ra On caught Byung saying "You laugh" i though you had some problem with your expressions. It was there three of them pulling each other legs and enjoying same with us. The third exam happen and Ra On decided to submit a blank sheet ash she don't want to stay in the palace. She helped the other two as she knew the answer for their question. Poor Ra On didn't knew that she will be in trouble this time for sure. The answer sheet were to be checked by Princess Myunguen. Thought being a bit dummy and chubby she caught on the beautiful ordering and recognize and the theme. She match both the letter and the answer sheet and it comes out the same persons writing. She ordered guards to bring the person here. The Eunch after receiving a beating told it wasn't him who wrote it was Hong/ Ra On. 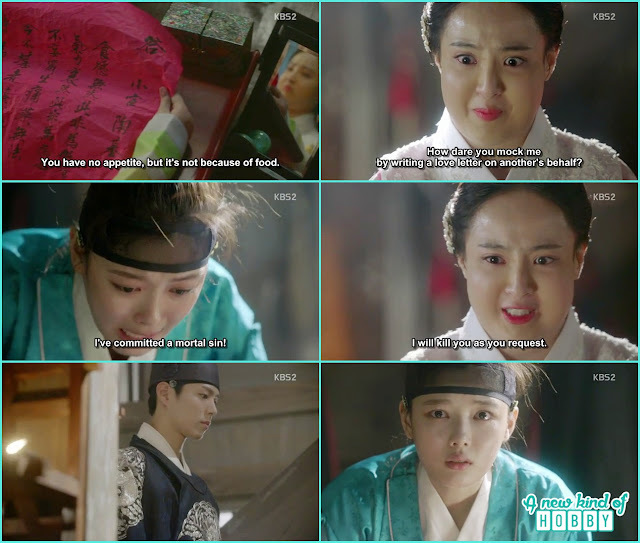 While cleaning she was kidnapped and when come to her senses she found herself in front of Princess Myunguen who raged in anger how could he wrote something like on any one's behalf. She was about to about to kill her Crown prince showed up. The climax it was surprised and shocked for Ra On the person she was treating commonly and was fooling around was non other then the crown prince. he episode ends here. Pitiful Ra On we wish good for you hope Crown Prince take ity on you and save you from Princess Myunguen's anger and he should be. Ra On life was tough as she was living disguise being a man and had to earn a living. She stuck in things one after the other. We feel pity and also sorry for Crown Prince he was being treated too unfairly and become a troublemaker for everyone. The Crown Prince and the second lead Yoon Sung made us confused who will take away Ra On. Who is Ra On side? Although we found many similarities in love in Moonlight and Sunkungwan scandal but it surely a unique story line aside driving the viewers with the second lead syndrome. The Funniest scene where Ra On bite Crown Prince Finger and he didn't realize he got bitten by a dog. So far we watch the two episode and the story id light smooth funny aside the conspiracy in the palace. Stay tuned, Happy K Drama Watching. Let's wait a week after for Love in the moonlight episode 3 review.